I just finished reading “The Shallows” by Nicholas Carr. I think it is an important text given the rapid rate of technological advancement in our postmodern world. I will try to not give away too much of the book’s details because I think that everybody should read it for themselves. I don’t want to spoil it for you so I’ll cover the points that I found interesting. The main idea that is suffused throughout the text is that our use of the internet/technology is distracting us from being able to think deeply in a sustained state of concentration. This kind of deep thinking is what has helped mankind reach our current technological level of sophistication. As the book’s narrative progresses, Carr gives us examples from past philosophers and cultural theorists (Friedrich Nietzsche and Marshall McLuhan) about how technology itself–not the technology’s content–effects how we think and develop cognitively. Carr also provides empirical examples of cutting-edge neuroscience research that further supports his claim that technology is distracting us and limiting our intellectual abilities. We tend to take our digital lives for granted; we use computers and the internet on a quotidian basis all the while thinking that these high-tech devices are enhancing our lives, intelligence, and ability to multitask effectively. As Carr points out…this couldn’t be further from the actual truth. Carr leads us to the conclusion that true understanding can only be achieved by thinking about one concept at a time for a sustained period of time. Books allow the human brain to be able to reach this level of true understanding because a book forces you to concentrate on one concept at a time in a methodical and linear manner. The web provides an antithetical experience to the act of reading a paper book. It encourages continuous digressions from one subject to another, from one medium to another–text to images to video to links. In other words, our brains are unable to process and transfer all of these disparate snippets of information from our short-term memory (working memory) into our long-term memory. By using the content rich multimedia that web has to offer, we are actually not absorbing information effectively due to cognitive overload. Carr paints a grim picture about the contemporary human intellectual mind, and we are not left reassured that this will improve in the days to come. While Carr focuses mostly on the negative neurological aspects of internet usage on the brain, he does briefly cover the benefits. Internet usage has made us more adept at being able to rapidly find specific information in a heuristic fashion. This ability to quickly find information has also promoted our related skills of skimming and parsing documents for the most relevant bits of information. However, this information swiftness comes at the cost of not being able to remember and contemplate the information that was acquired with such immediacy. The result is an overall superficial understanding. As I was reading “The Shallows” I found myself wondering what the intellectual landscape will look like in 5-10 years. Our rapacious appetite for new technology, faster internet connections, and innovative hardware/software is only increasing. What will become of the human mind in the future? Does this technological boom mark the end of the western intellectual/philosopher tradition, or will a new internet-philosophy emerge as we continue further in the digital abyss? Could we possibly see an intellectual elite rise to power in emerging/third world nations as they become more connected to the internet? None of the above questions are easily answered, and any answer that could be formulated would be speculation. The question that I think is the most salient is the latter regarding an intellectual elite gaining impetus in emerging and third world nations. This is one aspect that Carr omitted in his mainly western centric treatise. Does technology have the same effect on the brain of a person from a non-western culture? Would said non-westerner react the same way to the scientific tests describe in “The Shallows” as their western counterparts? We can infer that they would react in a similar way to the tests given that the human brain’s physiologically is the same, but humans are not the sum their brain’s physiology. The culture in which we are born and raised has a dramatic effect on how we absorb, parse, and process information. I think it would be interesting to see how people from other cultures would react to these tests. Having lived in a Western culture for my whole life, I have grown-up and developed with the computer technology as it was being released. With that being said…I feel that computer/internet technology is a part of my culture, my mind, and in some ways it defines who I am. I think it would be interesting to find out how people in developing nations view computers, the internet, and technology vis-à-vis their traditional cultures. In 5-10 years could the youth of these cultures start to see computers/internet technology as a part of their culture and how they define themselves? I hope that this would be the case. I also hope that Carr’s depiction of the new technologically savvy, yet “shallow” brain, doesn’t destroy rich history of human intellectual thought that has flourished over the past epochs. If you want to read “The Shallows” you can probably get it out from your local library. You can buy it from Chapters Indigo books (Canada), or Amazon.com. 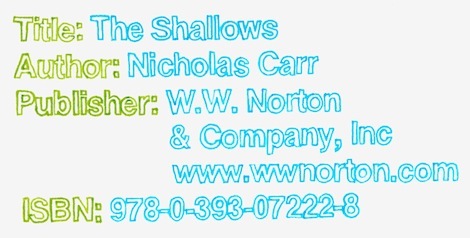 “The Shallows” is also available to purchase directly form the publisher W.W. Norton & Company, Inc.
Have you read the book? What are your thoughts? Tweet me. I know that there are many other videos about Watson on Youtube that give more technical insight into how it actually functions, but I found the above video particularly interesting because it relates to human intelligence. As humans we tend to pick up on nonverbal cues like gesture, facial expression, and body language in order to add context to words that are being said to us. This allows us to interpret these words in order to derive further meaning and subsequently understanding from what is being said. Nonverbal cues tend to be best understood when we are directly engaged in a conversation with somebody. In this situation the nonverbal cues are of equal importance to what is being conveyed to us verbally as the conversation progresses irrespective of whether we are conscious of them or not. After thinking about this for some time, I started to contemplate how we derive meaning from a story that we read in a book. A book has a narrative structure, however, there are no nonverbal cues from which we can interpret meaning. In the case of books…how do we derive the same kind of meaning that we get from engaging in a conversation with somebody? It seems that from our life experiences we are able to derive meaning from Hamlet, The Scarlet Letter, or Crime and Punishment because we have built up a memorised library of nonverbal cues from which we draw in order to interpret meaning from a book’s narrative. Watson has no way to analyze the same kind of visual cues as humans do in order to add context to the questions being asked. Instead, Watson searches each individual word in each Jeopardy question, and then cross-references this information against its own (self-contained) databases of information in order to understand the context of the question. Once an understanding of the question is achieved, it then looks for answers that best fit the context of the question. It uses statistical analysis to determine a list of possible answers, and then ranks those answers from most correct to least correct. Also, Watson is able to learn and eliminate answers from the other contestants responses (right or wrong). All of this takes the power of some 3000 3.0 Ghz processors, terabytes of memory, and a tremendous amount of electricity. Regardless, Watson is a milestone in AI research and it does produce mostly correct answers at lightning fast speed; It out performed Ken Jennings. So what does this mean for human intelligence? In the video above, Dr. Ray Mooney states at 1:07: “What the brain is doing is actually a lot like what computer hardware is doing.” This has been an principal paradigm in cognitive science research since the field’s inception. It is very easy to see the connection between the brain and a computer. Both take inputs of some kind, process the data, and then provide an output of the processed data. The electrons that are traveling through the circuits of a computer are also analogous to the firing of neurons in the human brain. Although the similarities are clear, I think that we need to be careful when applying the brain/computer correlation. There are fundamental differences between the human brain/human and a computer. Firstly, computers are deterministic, meaning that a computer will give you an answer based on the data that is given to it. If it’s given erroneous data the output will also be erroneous. If Watson were given poor facts, it would give an incorrect answer every time. Humans, on the other hand, do not suffer from this disability. We are able to take bad information and “spin” it into a cogent plausible argument (Lawyers). Secondly, computers must work within the bounds of formal logic. Watson at its foundational level must work on a YES or NO (1 or 0) logical structure…there is no middle ground. While I’m sure that many would argue that most things/situations in human life distill down to YES or NO as well, there is still room for an expansive middle ground where YES and NO are not always taken as the ultimate truths. The perfect example of this is in the legal field where facts/logic are important, but human rhetoric also plays a large part in determining guilt or innocence. I would hate to live in a world where a “Watson” type computer was determining guilt in a court of law. Over the last week I have been thinking about Watson a lot, and I’ve also been thinking about what it means to be human. I know that Watson wasn’t designed to be a true artificial intelligence vis-a-vis a human, but notwithstanding it’s ability to answer questions is remarkable. While I am a fan of Watson and I think that the technology is truly a feat human intelligence and creativity, I’m skeptical as to how intelligent Watson actually is. Is it even possible with enough processing power, memory, servers, etc to devise a machine that-at its core–is purely logical and deterministic to emulate the human mind/condition? If such a machine was built and it could pass the Turing test, is the machine intelligent like we are? All of these questions are very hard to answer. My personal opinion is that as humans we too live by rules that are programmed into us by our upbringing, social class, education, and values. In this way we a similar to computers, however, we have the ability to–on a whim–break our own rules and change the trajectory of our lives. As we live we are constantly writing and re-writing the code of our lives. The computer remains fixed in a set of predetermined rules that it can not break unless it’s given the option to break the rules by a programmer (the programmer is breaking the rules that he or she programmed into the machine). While Watson is autonomous on some levels(Decision Making, Machine learning), it can not be defined as truly self-governing. Human autonomy, and our ability to break rules is what truly separates us from intelligent machines. I’m sure that many would argue this point as to whether or not humans are actually autonomous. The philosophical debate could go on ad infinitum. I’m going to end this article off by paraphrasing something that I read by the french philosopher Jean-Paul Sartre. Sartre had said in one of his essays that he had never felt so free as when he was in a Nazi prisoner of war camp in the 1940s. He came to the realization that there was always a choice no matter what predicament in which you might find yourself. He reasoned that if the situation became unbearable in the prisoner of war camp, he always had the option of taking his own life. This is analogous to my previous example of changing the rules/your own rules on a whim. Until a computer can work through a similar kind of problem and realise its own autonomy, I don’t think we can call it truly intelligent. What are your thoughts? Tweet me.